SoftFluent CodeModeler provides several components to allow you to create enterprise-class applications. 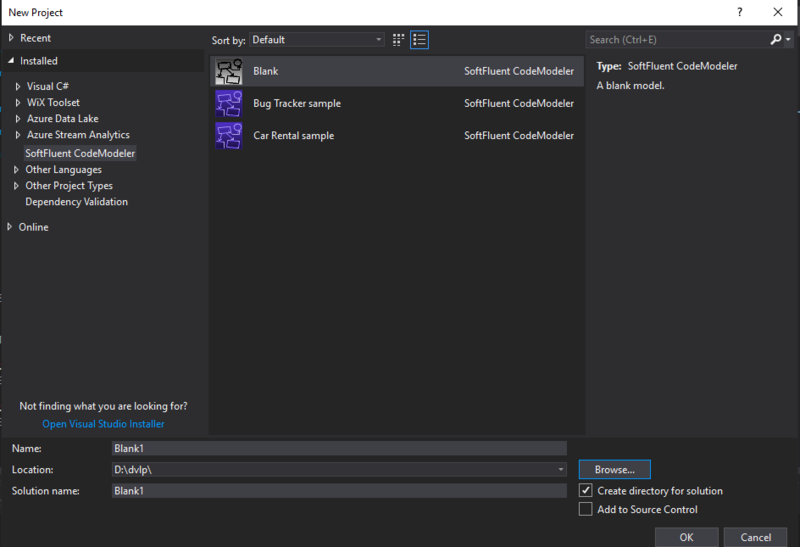 The Modeler: integrated to Microsoft Visual Studio 2017, let's you design your model in a graphic interface and generate code without leaving Visual Studio's familiar user interface. Open Visual Studio and create a new CodeModeler project by selecting "File > New > Project". In the "New Project" dialog, in the left pane, select "CodeModeler" and the "Blank CodeModeler Model" template. You can activate the product through the Activation Wizard which appears when using your first CodeModeler project. From the "Solution Explorer", in your project, expand the "Surfaces" node and double-click on the default surface named "Default" and add your first entities. SoftFluent CodeModeler is available at a price of $699/€599 per year per developer. This includes any upgrade available during the subscription (including versions for new versions of Visual Studio and/or SQL Server), and Professional support by email..